Latvia is a member of the European Union and possesses an open economy in the northern part of Europe. The current economy of Latvia is pretty stable and after the event of Brexit, it did not sustain any major threat. Though several scientists predict that in the long run Brexit may cast an impact upon Latvia’s economy, as there is a good chance that it may decrease the overall economic growth of the entire EU. The current IT industry of Latvia is pretty vibrant even after Brexit. But there is a good chance that it might be sustaining a few damages eventually. Here we are discussing the reasons to hire dedicated developers in Latvia. Over the past few years, different individuals as well as companies have been outsourcing different kinds of IT related projects to people residing in other countries. Just like the rest of the world, Latvia has also been outsourcing its IT projects to offshore companies for the past few years, but the trends for this country are changing now. Being one of the Soviet countries, Latvia remains quite competitive in terms of offering quality development services to other countries of European Union at a very affordable rate. Since Latvia joined EU only in 2014, demands from Latvian developers here are not so high. Average salary within the country remains quite low comparing to other European countries, Latvia is currently ranked as #24 (out of 28) in the List of European countries by average wage. At the same time average salary grew by 20.77% within last 3 years, which points at steady economics growth. Numerous Latvia dedicated development teams may easily be found to help you out on a variety of different popular technologies that are trending in the global IT world out there. The most common technologies in this regard include PHP, AJAX, JAVA and ASP.NET. These technologies are considered to be the primary requirements behind setting up any kind of IT infrastructure like a website or any other online system. Several firms have been looking to hire developers in Riga to work on a number of different spheres of information technology. These include ecommerce, healthcare facilities, universities and the rest of the education sector, business industry, banking sector, governmental and non-governmental bodies, etc. 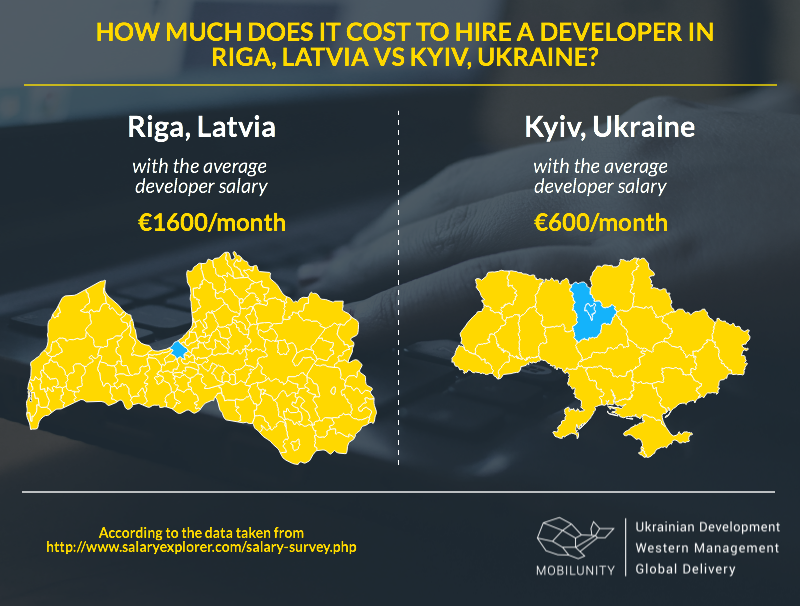 How Much Does a Developer Make in Riga? There are numerous cities in Latvia where a good deal of work is being carried out in the field of IT. Riga developers are highly known in the entire country as Riga is the biggest Latvian city on account of IT industry. The salaries offered to these developers are much higher in comparison to those residing in other cities like Jurmala, Jelgava, Daugavpils, etc. Individual software engineers have teamed up to work collectively in order to ensure the mutual benefits of each other. But if you think about it, the salaries of these software engineers are still below the average mark as their average salary equals less than €27,000 per year. Are you still looking to hire developers in Latvia? Contact us today and we will source you with the top programmers!